Darren DeFrain is the author of the award-winning novel, The Salt Palace (New Issues), and the short story collection, Inside & Out (MSR Press). Both books were acquired by Dzanc Books and are available through that press as eBooks. His stories, essays, poems, and miscellany have been widely published. DeFrain began his education at the University of Utah, where he graduated with degrees in English and Psychology and with a minor in Italian. He went from there to Kansas State University for his MA, then Texas State University for his MFA. 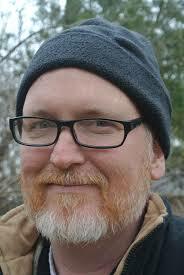 He was awarded his Ph.D. in Creative Writing from Western Michigan University in 2000. He taught at Waynesburg College in Pennsylvania and the University of Wisconsin–Fox Valley before coming to Wichita State University in 2005. He has primarily directed the Writing Program at Wichita State in that time, but has also served as Department Chair and MFA Director. He currently teaches classes on Composition, Composition Theory, Narrative and Narrative Theory, and Graphic Novels. He lives in Wichita with his wife, novelist Melinda DeFrain, and their two daughters. Beyond a place for me and Victoria to screw, the cooler has other important functions too. When it's hot like today, you can forget. Right now it houses three sides of beef, none matched to the other. Aging for three different customers, they've been hanging in the cooler for weeks. The edges are only now beginning to blacken. Victoria, however, is turning a bright pink, like some grocery store rose. I know this to be true, though I'm sweating away on the other side of the vaultish gray door, hurrying through teh clean-up, the blades of the slicer and grinder clanking and banging against each other in the hot suds of the sink. I'm anxious and I'm sick to my stomach. It tightens and turns around on me. It's a particularly hot day for Fairbury, this Tuesday, the last week of July. The cooler only feels refreshing at first. Even on those hottest dog-days, when I find excuses to be in there it doesn't take long for the sour smell of aging meat to lay on me, like it's probably lying on Victoria.